Synedoche: figure of speech wherein part represents whole, e.g. “crown” stands for “king” or “queen”. Objective Correlative: T.S. Eliot’s literary device, akin to metaphor, where an object or thing represents an emotion or feeling. How do I know such obscure things? Rather than following my dad’s advice to pursue a more practical career as a doctor or lawyer, I studied literature, finally taking an M.A. at UCLA. Later I was in the Ph.d program, but when confronted by an obscure question about a lesser-known English poet named Charles Lamb in the part one written exams, I walked out of that UCLA classroom room and away from the Ph.d program. I left three months later for Paris with $400 in my pocket, a big smile, and no real plans. I had gone to school in Paris a few years before so the City of Light was no stranger. When I returned to the States 2 years later, it was tough getting a decent teaching job, even though I had three teaching credentials and plenty of teaching experience. So I took an even more risky career detour into music. I would have been a terrible lawyer and could have never gone to med school to cut up a cadaver anyway. But going back to seldom-used literary terms, occasionally they crop up in real-life situations. For synedoche (sin-ek-dough-kee), I pulled into the SMC parking lot last Sunday to do my show. 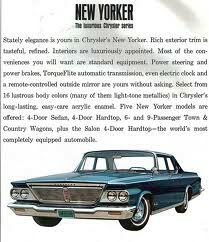 I beheld the 1964 Chrysler New Yorker sedan, blue-green and in glorious original condition. It belongs to Jason Groman, who runs logistics for KCRW, and also handles the KCRW mail and fulfillment departments, both crucial links between KCRW and its members. The Chrysler harkens back to the era of great Amercian cars and embodies the taste and sensibility of its proud owner, who loves classic things, whether they be Paper Mate pens, Lawry’s Prime Rib, classic Magnavox hi fi consoles, and Sinatra ballads on the original vinyl. It made me happy to see Jason’s car and to know I would also soon be seeing him. Everybody at KCRW loves Jason Groman. He’s a great guy and a unique human being. The Chrysler New Yorker truly reflects him. As for Eliot’s objective correlative: I used to think that Sinatra’s Only the Lonely was his best album of torch songs. Then I heard In The Wee Small Hours, and that trumped Only the Lonely. Then I discovered No One Cares, and realized that this was numero uno. 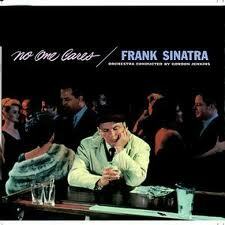 On the cover of No One Cares, we see a photo of Sinatra in a club at the bar, alone, down and depressed, nursing a glass of whisky, smoking cigarettes while others gaily dance and romance in the background. Then you look at some of the song titles: ”A Cottage for Sale” is about a failed marriage. ”Stormy Weather”, captures his tempestuous marriage and divorce from Ava Gardner. These two song titles capture the essence of the album. T.S. Eliot’s term, originally meant for aspiring poets, actually comes up a lot in music. These are just two examples. So even though obscure literary terms do not have much use in daily life, occasionally they spring back to enliven the little things that make life more interesting. And you don’t need a Ph.D to appreciate them.